Are you brave enough to take the Extreme Car Stunts challenge and skilled enough to master it in Extreme Car Stunts 3D Game? Let’s see if you can survive the most stimulating stunt arena! The wild and crazy fantasy stunts city will blow your mind! Modern stunt environment, awesome car smashing machines and mechanized techno based obstacles. Perform high jumps on colossal ramps and accelerate through fiery hoops. Jimmy through deadly propellers and knock down and smash all types of obstacles. Dash and race through the stunt city at lightning fast speed displaying cool tricks! 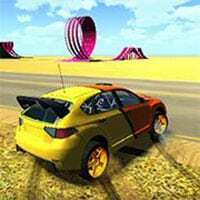 Enjoy and have fun in playing Extreme Car Stunts 3D Game. Also make sure to check out Moto Trials Beach 2, Road Rush Racer, Parking in Istanbul, Neon Biker and Swerve Game. We picked up these games for you from our driving games. So have fun.